In late 2006, Clear Channel Music posted the entire The Rising Tied album complete with commentaries from Mike Shinoda before each song. On "High Road", he said, "‘High Road’ is one of those songs, that I… it just makes me happy. Like it just sounds like a good time to me, sounds like a party. I love playing it live. When we play… when Fort Minor plays shows live, we play… I put together a band of three string players, three backup singers, drummer and a DJ, and it’s me, and Styles Of Beyond on the mic, it’s just a… it’s just a good time and this is one of those songs that I love to play." The chorus on "High Road" was originally sung by Mike himself, but he thought John Legend's voice would sound better than his and sent him the track to see if he liked it and wanted to sing it. He liked the song and sent it back with his vocals right away. The two had met when Mike went to see a John Legend and Alicia Keyes show in Los Angeles. "High Road" debuted at Fort Minor's show at MySpace's 2nd Anniversary Party, where it was performed as the second-to-last song in the set. The song remained in this spot for all of its performances until the Asian Tour, where it moved down to the third-to-last song. Eric Bobo joined the band on drums for performances of the song during the group's U.S. Tour in early 2006. 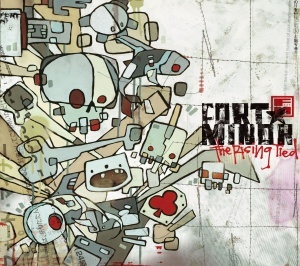 "High Road" returned when Fort Minor made its comeback with "Welcome" in 2015. The song didn't feature a new remix like several other songs did, and instead was just performed as its studio version. The song was performed at the end of the main set. "High Road" returned at the very end of Mike's Post Traumatic Asian Tour at the tour's last stop in Singapore. The band rehearsed it at soundcheck earlier in the day as reported by fans as and as posted by Dan Mayo on his Instagram story. During the show, Mike said it was requested by the band's long-time tour manager Jim Digby. Keep talkin' while I'm walkin' away! But it's not gonna work today! All I really want, I'll say again! Keep talkin while I'm walkin away! This page was last edited on 23 August 2018, at 07:11.